In Hong Kong’s bustling Kowloon district, journalists and fans pack into a small store. 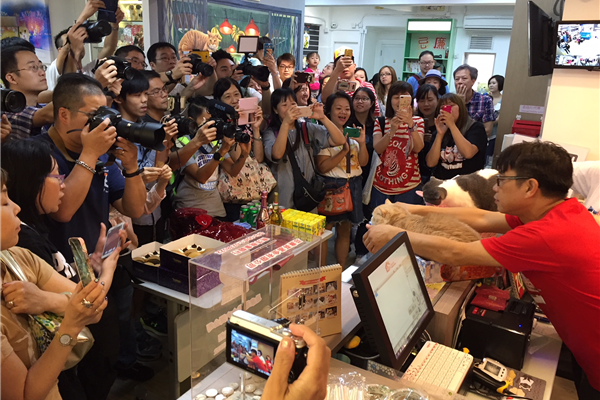 They crowd towards the shop counter, cameras raised aloft, vying for photos of a national celebrity. The subject of interest is crouched in a box, unimpressed by the commotion. Brother Cream, a plump orange-and-white cat, rose to fame five years ago as the adopted resident of a local convenience store. Today, he has a public relations team, an official cat food brand, a Facebook account with more than 200,000 followers and a wife named Mui Mui. Brother Cream’s stardom is just one example of the rising popularity of cats across China, especially among urban youth. Chinese netizens follow famous cats online, share photos of their own felines and send each other cat-themed stickers on WeChat. 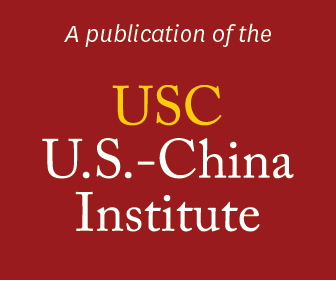 But the growing influence of cat lovers also extends beyond pop culture: it affects the Chinese economy by driving recent growth in pet-related industries. Pet Fair Asia, the largest pet supplies trade show in Asia, plans to host its annual exhibition in Shanghai on a “world record” scale, expecting 1,400 exhibitors and 110,000 consumers to attend. From individual pet owners to entire industries, the surge in the popularity of cats reflects the lifestyles of urban Chinese youth, and provides insight into how trends such as urbanization and social media are changing the country. For more than 2,000 years, Chinese people have expressed their love for cats in classic texts, poems and paintings. Today, cats continue to loom large in popular culture, from the Japanese-imported “fortune cat” statues on restaurant counters, to the recent $170 million-budget Chen Kaige film “Legend of the Demon Cat.” In January, a Xinhua News article identified the growing number of cat lovers and owners as “big news in China,” boosted by the recent popularity of “cloud cats”: photos and videos of cats posted by their owners on social media. It’s not just images of felines that are popular: more Chinese are raising pets, for several reasons. According to a 2017 report on pet owner consumer trends conducted by JingDong Data Institute, the recent growth of pet-related industries corresponds to China’s rising GDP, and can be attributed to consumer habits driven by urbanization, the one-child policy and an aging population. In 2016, China’s pet product market rose to 120 billion RMB (more than $18 billion USD). The institute identified females and white-collar workers as the largest group of pet owners. A variety of businesses and services have emerged to cater to the cat craze. The Shanghai Traditional Chinese Medicine Neurology and Acupuncture Animal Health Center offers acupuncture services to cats and dogs. Ciwei, an information technology company, held a cat exposition in Shenzhen last October that drew 6,000 attendees. Cat cafes are a popular business model that are increasingly common in many Chinese cities. The cafe owner provides a home for several cats, many of which are adopted, and customers get to enjoy their beverages while pampering the felines. Cat owner Zhang Xuechen told Xinhua News that cat cafes “…are popular among Chinese youth and have become good places to make friends.” Liza, who chose to be identified by her English name, runs a cat cafe in Shanghai called Marvelous Cat Garden. Her cafe receives a wide variety of visitors, including tourists and families. She observes, “We find that citizens’ incomes are increasing, while their living pace is intensive, so they like to spend on pets to gain some comfort.” The cafe even occasionally hosts company events, birthday parties and alumni reunions. Social media posts by Chinese actresses Fan Bingbing (left) and Liu Yifei (right) posing with their cats. 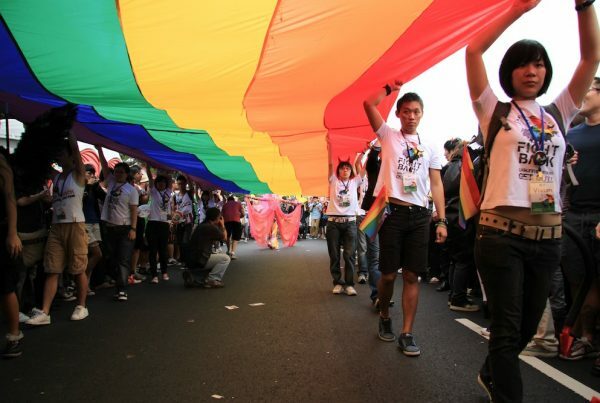 The “empty nest youth” are a generation of Chinese who were born in the 1990s, and who live far from their hometowns to work in large cities such as Beijing, Shanghai and Shenzhen. These young professionals often live alone, and many cope with the loneliness and stress of urban life by raising cats in their apartments. They also contribute to higher disposable income levels in Chinese cities, which has driven growth in pet-related industries. 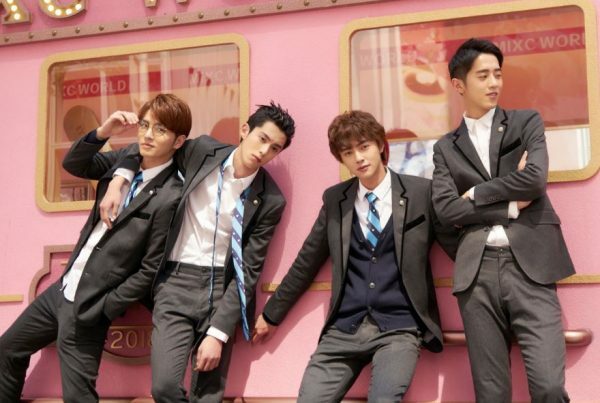 Young adults in urban areas often shop online, and according to DaXue Consulting, e-commerce provides more convenient channels for buying pet-related products. In January 2016, a popular online e-commerce site for pet products called Boqii obtained a $120 million investment. Young urban Chinese have also spread the cat-lover trend via social media. 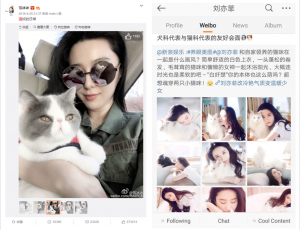 Many prominent celebrities, including Angelababy, Fan Bingbing, Hugo and Liu Yifei own cats and share images of them on their massively popular social media pages. While social media-savvy youth seem to be at the forefront of the cat craze, cats hold a special meaning for many older Chinese as well. In the parts of Hong Kong that still host small, traditional businesses such as dried goods and herbal medicine shops, “shop cats” like Brother Cream are a common sight. Photographer Marcel Heijnen documents the city’s shop and market cats in his project “Chinese Whiskers,” a popular series that has recently received attention from news groups such as South China Morning Post (Instagram handle: @chinesewhiskers). 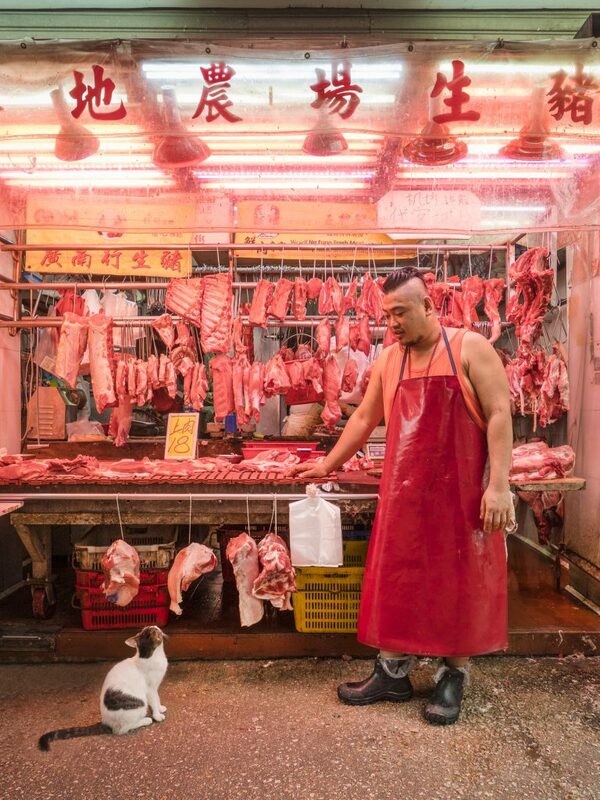 Heijnen shows cats in what appear to be unexpected, noisy environments: in one photo, a burly butcher smiles down at his cat in a neon night-market stall, with slabs of meat hung on racks behind him.